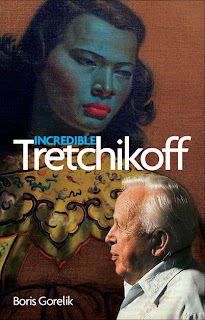 Incredible Tretchikoff: Tretchikoff is up for grabs! 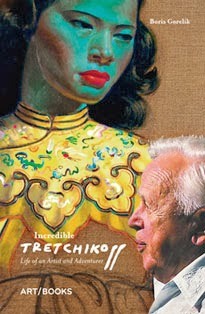 Tretchikoff is up for grabs! Never exhibited in the lifetime of the artist, this painting has a special place in Tretchikoff’s arsenal of stories about himself. In September 1954, after the highly successful tour of the US, Tretchikoff arrived in Toronto. He held a show at Eaton’s, a Canadian social institution. This chain of department stores had once been known as the largest retail organisation in the British Empire. Nearly 52,000 visitors attended his exhibition at ‘Canada’s Greatest Store’. Eaton’s hung Tretchikoff’s work in the foyer of the auditorium that hosted stars like Duke Ellington, Billie Holiday and Frank Sinatra. One day, a stocky, broad-shouldered old man entered the foyer. He moved from picture to picture, hardly ever slowing his pace. The Eaton’s directors watched him in awe. The old man was Jack Hammell, a mining magnate who had ‘cracked open the north’. He pioneered the large-scale mineral exploration of Canada’s remotest regions. His aeroplanes moved people and materials to the areas that could only be reached by dogsled or canoe before. Canadian Airlines is a direct descendant of Hammell’s fleet. A former boxer, this powerful man was feared by many. But he had a soft spot for the arts. It is said that Hammell owned works by Titian, Rembrandt and Gainsborough. Hammell bought several paintings by Tretchikoff at the Toronto show, including two portraits, a Zulu and a Sotho woman. Since the Canadian tour was far from over, he agreed to receive his purchases later. But when they eventually arrived, Hammell claimed that they were not the ones he had acquired. Although Tretchikoff insisted that they were correct, in order to appease the ‘big bully’, he flew to Toronto. 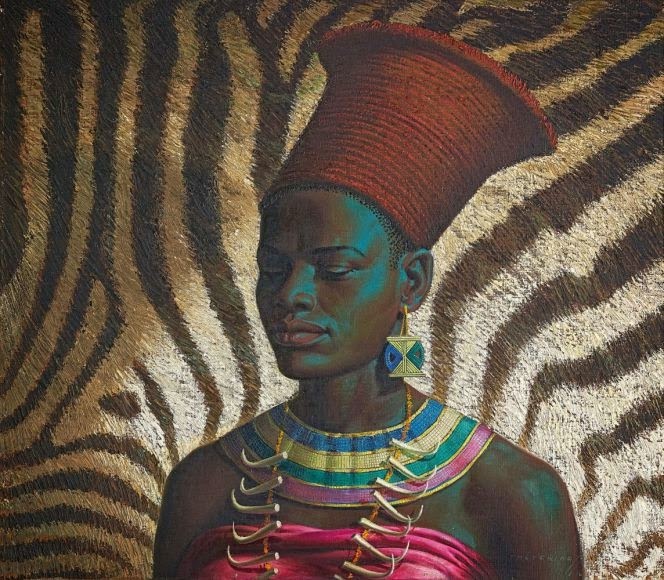 He took with him his new work — a study of a Zulu woman set against the background of a zebra skin. Tretchikoff proposed exchanging it for the two paintings in question. When the painter showed the canvas, Hammell liked it so much that he returned the two works to Tretchikoff and kept the new painting. They parted the best of friends. On the next morning, Hammell bought the two paintings back from Tretchikoff. Jack Hammell died childless in 1958. His wife survived him by two years. It is not known who inherited his extensive art collection. One of the few works that has resurfaced is Zulu Maiden. In 1999 the sale of this painting by Stephan Welz — also in Cape Town — marked the revival of interest in Tretchikoff. The painting was knocked down for an amount that exceeded the initial estimate sevenfold. Tretchikoff completed this painting in 1956, during his golden decade. It was in the fifties that he produced such mass-market masterpieces as the Chinese Girl, Lady from Orient, Miss Wong and Balinese Girl. The Zulu Maiden is Tretchikoff’s typical ‘exotic’ portrait. In his oeuvre, it is this kind of painting that is most sought after. And, unlike his pictures of Oriental women, it is purely South African in its subject matter. Iziko South African National Gallery, Cape Town, Tretchikoff: The People's Painter, 26 May to 25 September 2011, catalogue number 42. Boris Gorelik. (2013) Incredible Tretchikoff, Cape Town: Tafelberg. Page 177. Vladimir Tretchikoff and Anthony Hocking. (1973) Pigeon’s Luck, London: Collins. Pages 238-40 [unnamed]. Tretchikoff for £8,000? It's a bargain!